Maureen Louis, J.D. will be the 2018 recipient of the Neil Postman Award for Mentorship, which recognizes the individual’s mentorship of students and new members of the New York State Communication Association (NYSCA). Cazenovia College became only the second college/university to host two Postman Award winners (NYU being the other). The recipient of the award is determined by past presidents. Elizabeth Dobson was awarded the top student paper award; Aaron DeLoria was the runner-up, with undergraduate submissions from a number of distinguished colleges and universities such as Fordham University and New York University. 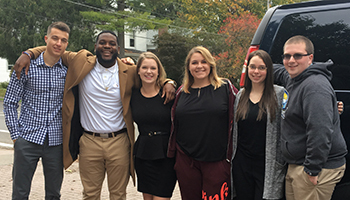 Four other students also presented competitively selected papers including Paige Lott, Michelle Matson, Ahmon Powell, and Ty Zelinsky. Each student’s paper was reviewed by at least two faculty members and then forwarded to the vice president of NYSCA for a final determination. In addition, Macy Michaels and April Rink, alumni from the class of 2017 who are at Syracuse University's Newhouse School of Public Communications pursuing their masters, were in attendance. They both submitted their Cazenovia College capstones which were selected as graduate student papers. Shares Dr. Heather Maloney-Stassen, "I think that the best, most special, part of the conference is hearing my students present. I am always so impressed, and downright proud, of their skills, hard work, and overall accomplishments." A panel of faculty from Cazenovia (and two other institutions) presented a very well attended and received discussion looking at the intersection of politics and pedagogy, with Dr. Erica Miller, Dr. Bruce Roig and Dr. Tracy Trachsler joining the group. Professor Louis was re-elected to the executive board as a member of the nominating committee and Dr. Maloney-Stassen began her role as the vice president and 2018 conference planner. She is a prior recipient of the Neil Postman Award for Mentorship.